Spiffy’s president and co-founder, Karl Murphy, is a featured veteran in the Sage Power 50. A unique showcase of veteran businesses in the US, Australia, UK, and Canada that were nominated for their leadership and determination. Karl explains, "I'm incredibly proud to be included in a such a high impact group of veterans from around the globe. My time in the Army was my first and arguably most important professional training. Everyday I rely on that early education to help manage and lead our team across the US. All the way...and then some!" Spiffy is proud to be veteran-owned and would not be where we are today without strong leadership. Get your copy of the Sage Power 50 here! Support veteran owned businesses like Spiffy! 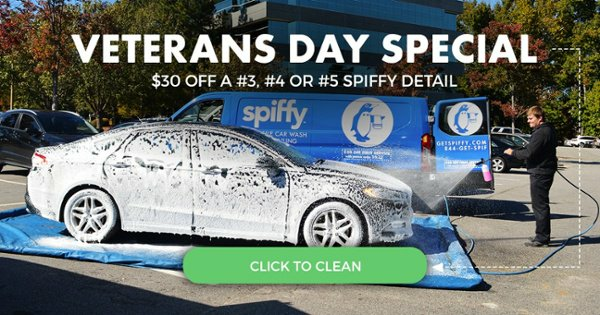 For a limited time Spiffy is giving $30 off #3, #4, and #5 services, learn more.